For this New Zealand Luxury Vacation: Rejuvenation and Discovery package, a couple from Northern California wanted to travel to the South Pacific for wellness, meditation, and spa. We sent them to New Zealand, where stunning scenery perfectly complements a spa and relaxation itinerary to soothe the soul. This New Zealand Luxury Vacation has some of the best spas in New Zealand with massages, a meditation session, saunas, jacuzzis, and steam rooms galore. We started our California couple in the Bay of Islands for 3 days of spa treatments and beautiful ocean views at The Lodge at Kauri Cliffs. Then they took a leisurely drive through to Auckland, spending a night in New Zealand’s largest city before continuing on to Taupo. They stayed at the elegant Huka Lodge, a sophisticated country-style lodge with gorgeous views over Huka Falls. Their sophisticated suite was the ideal place to indulge in relaxing massages and delicious New Zealand wine. Next on their New Zealand Luxury Vacation, they journeyed to the South Island and spent 4 nights at Split Apple Retreat. At this total wellness resort, they relaxed with massages, yoga, saunas, and more. They had a gourmet thoughtful food cooking class and a wellness consultation with an onsite expert. Their package also included free transfers into the gorgeous Abel Tasman National Park for hiking and adventure. They even got to see some dolphins in the water! They finished their New Zealand Luxury Vacation at a gorgeous lodge in Queenstown, Blanket Bay. In this tranquil alpine setting on the shores of Lake Wakatipu, they were utterly pampered with massage therapies, refreshing treatments, and soaking in the alpine view Jacuzzi. In true New Zealand style, they decided to get a heavenly Manuka honey facial. After 2 weeks of indulgence, their New Zealand Luxury Vacation came to an end. They began their journey home feeling completely rejuvenated in body and soul. Early this morning, arrive in Auckland and meet our local Down Under Endeavours representatives. Then collect your rental car and make the gorgeous (and adventurous!) drive up to Bay of Islands. Your home for the next 3 nights is one of New Zealand’s premier luxury properties: The Lodge at Kauri Cliffs Lodge, overlooking the Pacific Ocean. 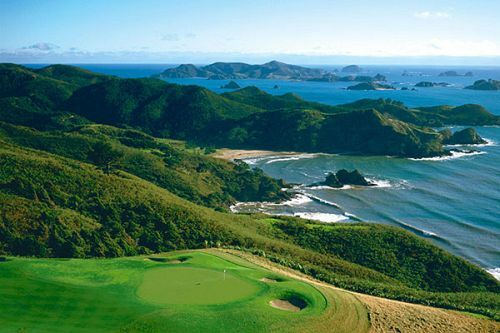 Set on 6,000 acres near Matauri Bay, The Lodge at Kauri Cliffs affords spectacular 180-degree views of the Pacific Ocean, Cape Brett, and the offshore Cavalli Islands. Your stay here includes pre-dinner drinks, hors d’oeuvres, a la carte dinners, and a complimentary mini bar. Also included is use of the heated infinity pool, hot tub, lap pool, sauna, jacuzzi, tennis courts, 3 private beaches, mountain bikes, and ample walking tracks. The next 2 days are yours to spend at your leisure. Enjoy the fabulous spa, play the world-famous golf course, or simply soak up your breathtaking surroundings. Two private beaches are available for guests of the lodge. You’ll drive past enormous kauri tree forests and quaint townships today en route to Auckland, the City of Sails and New Zealand’s most populous city. A 1-night stay here is enough to explore the luxurious So Spa and unwind at some of the city’s stylish bars. Enjoy a drive through the green hills of the Waikato region to serene Lake Taupo and your accommodations at the acclaimed Huka Lodge. Enter a world where elegant and generous hospitality meet sophistication and style, creating a welcoming haven among awe-inspiring surrounds. Rejuvenating massages, facials, and other beauty treatments are available in the comfort of your spacious suite. Drop off your rental car at the airport and fly to the South Island today, where you’ll be transferred to New Zealand’s most luxurious spa retreat and your home for the next 4 nights. They’ll welcome you with tea and a bottle of award-winning New Zealand pinot noir or sauvignon blanc. You’ll have full use of all retreat facilities, including gym, infrared sauna, steam room, outdoor spa pool, infinity swimming pool, and theatre. Spend the next 3 days being pampered at your luxurious retreat. Your Wellness Package includes 1 deep tissue massage apiece, a 1-hour yoga or personal training session, a gourmet thoughtful food cooking class, and a personalized wellness consultation. You will also have opportunities to explore the stunning Abel Tasman National Park on a private charter boat. Here, you can hike through native wilderness and golden sand beaches, go sea kayaking, and spot dolphins in the water. Your days at Split Apple will leave you feeling reconnected with nature and yourself. A short flight to Queenstown in the heart of the southern Alps brings you to arguably the most luxurious lodge in all of New Zealand. Located outside the township of Glenorchy on Lake Wakatipu, Blanket Bay is a haven of tranquility and calm. Here, you will be surrounded by understated luxury and breathtaking natural surroundings. You can discover endless ways to restore your physical and spiritual wellbeing. 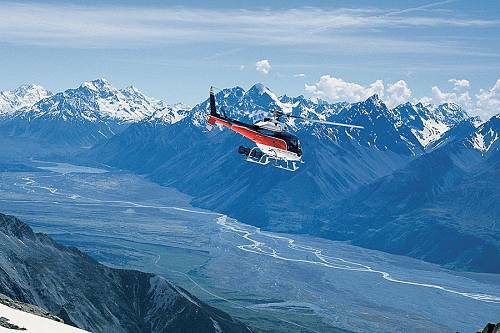 Today, take in the breathtaking scenery of the South Island on an amazing helicopter journey. First visit the pristine Fiordland National Park and land at Milford Sound. Then, discover the glacial expanse of the Franz Josef Glacier, followed by a visit to the heart of the Aoraki/Mt Cook National Park. During your alpine landing, view spectacular hanging glaciers and rivers of moving ice. Enjoy a day at leisure to relax and soak up your beautiful surroundings. Incredible spa treatments are available at the resort. Perhaps take a dip in the Jacuzzi with a glass of champagne, with the windows open to reveal the crystal-clear lake, dramatic mountains, and fresh New Zealand breeze. Today, you’ll check out of your lodge and enjoy a private transfer to the Queenstown airport for your flight home, feeling refreshed and rejuvenated by your spa and relaxation retreat in the world’s most beautiful country.